My Book - The original concept! I wanted to write a book about my experiences of exercising during pregnancy and post-partum. People including doctors are afraid to give pregnant women anything but ultra conservative advice in case something happens. I’m wrote the kind of book I would have liked to have read when I was pregnant and in the same situation. It is also a story of an ordinary woman keeping her sport and training on the go because she didn’t want to lose this part of her identity just because she was also becoming a mom. 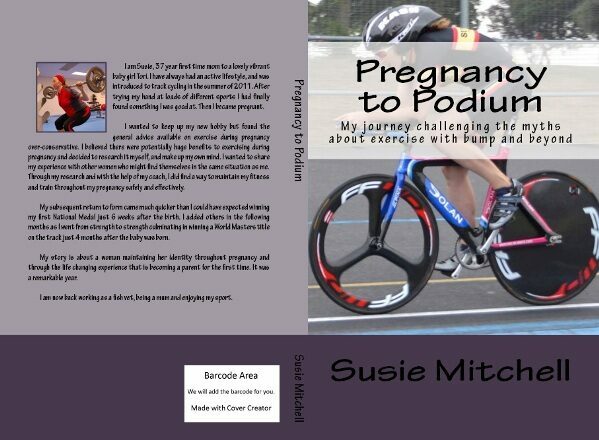 I was writing this book throughout my pregnancy and long before I won my first national medal which came just 6 weeks after the birth. The World Champion part was the icing on the cake, not something I could have planned for but did make a nice chapter at the end. Susie Mitchell was a 37 year old first time mom when she gave birth to a lovely baby girl Tori. She currently lives in Dublin, Ireland with her supportive and long suffering husband Cormac. Working as a fish vet, she travels the length and breadth of the country visiting fish farms, jumping on and off trawlers in all kinds of weather. 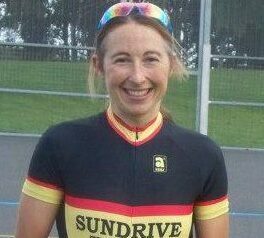 Susie was always into some sort of sport and coming from a background of surfing and adventure racing, recently tried her hand at track cycling. Discovering she had a bit of a talent for it, it quickly became her new-found passion. She is up on the bike training whenever she finds the time, slotting in sessions at the weirdest hours and in usual places. She tries to juggle being a mum, wife, training and working with reasonable success. This is a version of the book I always wanted to write but kept putting off. Everything I thought and felt during pregnancy and training to a high level is reflected in this book. Susie's story is one that all athletes and expectant mothers will relate to and confirm their gut instinct to continue what they enjoy doing throughout Pregnancy with the key message being to listen to your body, adjust and adapt as necessary, go forward and do not be afraid. What a refreshing book. A remarkable insight into the subject by someone who has been there done that and worn the rainbow "T" shirt of a world champion and has a wonderful daughter to prove it all. It would take the tenacity of an elite athlete to take any subject about which little is written and write "The book. It should be mandatory reading for all pre-natal and peri-natal healthcare professionals, and recommended reading for all sports club officials and staff in gyms and fitness centers everywhere. It is the story of a remarkable journey undertaken by a remarkable young woman that reflects hundreds of thousands of journeys undertaken annually by mothers of all fitness levels. The story is told in a forthright and erudite way with not a little humour the reader can sense the mischievous sparkle in the authors eyes. It is also a remarkable insight into the female psyche, of immense benefit to any bloke whose partner is pregnant irrespective of her athletic abilities or achievements. Highly recommended reading. Thanks Susie and good luck in the future one thing is for sure Tori will not want for sound advice and wise council when her time comes. Susie tells her story with such honesty and in a way that it was hard to put the book down until finished. Her journey takes you through her ups and downs but with her determination and perseverance shows that if we want something badly enough there is always a way to achieve. Great read for all. I really enjoyed reading this pregnancy story. I was interested to see how Susie managed to stay so fit while pregnant as I virtually gave up exercising when pregnant as I was afraid of something going wrong. In the end I just was glued to Susie's story and felt like I was reading the story of an athlete going from strength to strength who happened to be pregnant. Amazing success story. Just shows you what you can achieve when you put your heart and soul into something you believe in. Brilliantly captures the tension between societal perceptions regarding the sacredness of pregnancy (which often brings about restrictions and expected behaviours) in contrast to the phenomena of pregnancy actually being the most natural adaptive states. In Susie's case, training consistently throughout pregnancy (and post birth) brought about an impressive (and scientifically explained) physical alteration which ultimately strengthened her as an athlete- with massive sporting success as a result. The understanding, acceptance, creativity and professionalism of her coach also plays an central role in her remarkable journey. Exceptional story, exceptional athlete. If you're a female athlete who's petrified of getting pregnant and of what this will mean for your fitness, read this book! Susie writes in an accessible and honest manner about how she discovered she was going to have a baby just as she was on the cusp of becoming one of Ireland's top track cyclists. She tells how she handled her training throughout her pregnancy, all aided by the fact that she is a qualified vet who understands the physiological changes that occur during this time. And she gives practical advice that she learned along the way regarding dos and don'ts when pregnant and still wanting to maintain racing fitness. This is a real story of a committed athlete trying to become a good mum - such a refreshing read after all the theoretical textbooks out there on the subject. Refreshingly honest, written with good humour! Susie's background as a Vet helps her cut through so much of the ultra conservative misinformation surrounding the subject. A fabulously inspiring story on of one woman's journey through the biggest change that can befall any of us. Something for everybody here and hey think the fathers will enjoy it too!! Really enjoyed this book,mainly because it was refreshingly un-conservative in its views on exercise and what you can do during pregnancy - basically anything you want! After buying a number of other books on exercise and pregnancy it made a nice change to be able to read a book that dealt with the science as opposed to the "don't do it just-in-case" approach. It has loads of information about the changes your body undergoes during different trimesters, and how this affects exercising at different stages, and even how to turn pregnancy to your advantage when training. Very positive and has motivated me to get out and do it. Also a good insight into the shock of becoming a parent for first time!! This is a pretty good self-published book---there are certainly some spelling errors and the like, but as long as you're not overly picky about things like that, the information presented in the book is still interesting and it is a fast read. Sue comes from a scientific background and goes through her process of looking for scientific data on exercise and pregnancy, for which there is very little available. What actual data are available, however, seemingly cannot conclude that there is any reason not to exercise, exercise even moderately strenuously, or begin new exercise programs. I think most doctors/midwives these days agree that continuing current exercise programs is good, but what about starting new ones? How strenuous is too strenuous? These are some of the questions that Sue tries to answer in her own life. I picked up this book because, while I was running some in my life when I became pregnant, it became easier to cycle, and I've always enjoyed cycling more anyways. Soon after becoming pregnant I decided that afterwards I would participate in a triathlon, so my question was how much could I train before the birth. Sue is pretty a much a professional at her sport, whereas I compete just against myself and for fun. I'm happy to say that I kept cycling throughout my pregnancy, ramping it up for a little while (e.g., a 42 mile ride a month before due date), and then tapering off because it just wasn't as comfortable that last month. I still ended up doing a 11.5 mile ride on my due date, and delivered a healthy baby boy three days past the due date. This book gave me the encouragement to keep doing what I was doing----five days after the birth, I hopped on my bike and did a quick test mile, and found out that I could easily keep going. The only thing lacking in the book, in my opinion, was more about her personal life and how much her training affected her relationship with her husband. However, some readers may appreciate that Sue sticks to the topic of training and pregnancy rather than writing about her personal relationships. I can't say enough good things about this book! It was just the encouragement I was looking for! I was asked to join a cycling team last year and have fallen in love with time trialing. I couldn't imagine giving it up during and after pregnancy as I have already come so far and know I can continue improving. Although, I am not currently pregnant, when the time comes I will definitely keep this book in mind as a great source of inspiration. Reading this book has made the whole pregnancy and birthing process seem a lot less overwhelming and, as I can imagine I will never really know what it is like until I have actually experienced it, it is great to have read about a like minded mom. A BIG THANKS to Susie Mitchell for taking the time to write this book as the first thing I noticed when looking for information about exercising while pregnant is how much walking and swimming is mentioned. I am a terrible swimmer and walking is not going to keep up the level of fitness I currently maintain! I look forward to reaching all my cycling goals! I really enjoyed this book and feel spurred on to keep up my cycling during my pregnancy. All the midwives I've met have been really encouraging of my ongoing exercise during my pregnancy but there is always an undercurrent of caution and fear. This is a great book to keep you motivated. It is by no means a work of literary genius (hence 4 stars not 5) but a wonderfully inspiring story.